Japanoid. 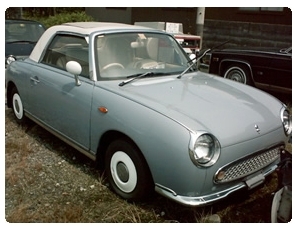 definition: Japanese compact cars too cool for North America. Changing the vehicle import law from 15 years to 25 years IS A BAD IDEA. As you know, according to current law, Canadian citizens can import any vehicle outside North America that was manufactured 15 years ago or older. American citizens can also import vehicles to the US, but they have to be 25 years or older. Pressure is building for Canada to change our law to match the United States, 25 years. This change in law would unfairly limit Canadian consumers and destroy many small businesses. Imported vehicles are safe, environmentally friendly, cost effective, and in such low numbers they pose no threat to the Canadian public. Transport Canada claims that since these vehicles are not manufactured to American Standards, they don't belong on Canadian roads. While this is true for some imported vehicles, the origin of nearly all imports is Japan, Germany and the UK; not exactly countries known to be unsafe. All three of these countries rank in the top 10 for road safety; while Canada and the US rank 11th and 25th respectively, Germany (#8) Japan (#6) and the UK (#2) do a much better job. According to 2002 statistics, 9.3 Canadian drivers died for every 100,000. In the United States this number is 14.9; not a system we should align with. And although Transport Canada claims Canadian and American standards are better than the 52 countries who are part of the World Forum for Harmonization of Vehicle Regulations, most experts fiercely disagree. Ask a Swede (#1) or the Dutch (#3), heck even the Swiss (#5) are in that club. It can be claimed that imported cars are in fact safer than their domestic counterparts of the same age. A majority of these foreign imports are arriving from Japan. Besides the recognized quality of Japanese cars, domestic use 15 year old Japanese cars are amazingly well maintained. The Japanese don't fool around with safety; they force every car on the road to pass a strict inspection every two years. This system of Japanese inspection standards called the "Shaken", tests brakes, emissions, shocks, tires, body condition, everything. As a result, the most popular imports are much safer than vehicles sold in North America 15 years ago, which don't have mandatory inspections. Besides, Canadians who import 15 year old cars don't exactly bring these vehicles in and drive away. Upon entry, importers pay custom duties and tax, go through agricultural inspections, modifications inspections, provincial inspections and in BC, emissions testing. Any and all maintenance, repairs or modifications have to be made before a vehicle is granted approval for road use. More often than not, new headlights, tires, reflectors, catalytic converters, and day-time running lights are added to these vehicles, making them compliant to Canadian standards to the very last detail. Canadians buying these vehicles are looking for a healthy alternative. A majority of the cars imported are fuel efficient or Bio-diesel ready. 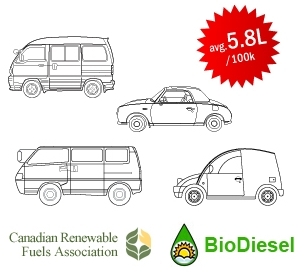 Diesel Toyota Lancruisers, Mitsubishi Delicas, VW Sycros and Jettas are often readily converted to Bio-Diesel. There is no real domestic alternative to these multi-passenger four wheel drives. Additionally, many Canadians prefer the smaller set, the Kei Cars with 660cc engines. Kei cars get an average of 5.8l/100kms, which if sold new would qualify for an ecoRebate from the Canadian Government. And although Transport Canada claims that older vehicles and smaller engines don't always mean fewer pollutants, California's Smogcheck Program exempts diesels and engines under 800cc. In addition, Kei Cars save space on our crowded roads and public spaces. And unlike their hybrid counterparts, take much less energy to manufacture and dispose because of their small size and simple materials. Transport Canada and the Canadian Council of Motor Transport Administrators (CCMTA) also claim that Canadian drivers are incapable of operating Right Hand Drive (RHD) vehicles safely. This claim has no evidence to back it up. Japan and England drive on the left side of the road and thus manufacture RHD Vehicles. However, Japanese and British citizens have the freedom to import vehicles from Left Hand Drive (LHD) countries like Canada and the US. Ford, Mercedes, Chrysler, and General Motors left hand drive vehicles can be bought new in Japan without any question. Vehicles imported to Japan do not have to meet Japanese Safety Standards, only emissions regulations. The Japanese do not pay more for insurance; are not required to take additional tests and are not subject any other form of prejudice for choosing a foreign vehicle. The Japanese even provide LHD toll-booths to facilitate LHD vehicles. If Canadian authorities feel the Canadian driver is not as competent as the Japanese or British driver, they should provide us with the basis for this belief. Some attribute our Canadian policies to pure protectionism. Transport Canada instituted the 15 year old import law in 1986 for the benefit of car collectors collecting American muscle cars. Today many Canadians are taking advantage of this law to import environmentally friendly vehicles from places like Japan and Germany. Given the current concerns with global warming and the movement towards freer trade, it is difficult to understand why Transport Canada wants to change the law to 25 years. Just like back in 1986 the number of imported cars on Canadian roads is extremely low. Out of the more than 18 Million cars in Canada there are no more than 73,000 cars that fall under the 15 year import rule; this is only 0.004% of cars on the road. And many are driven only on weekends or off-road. Clearly not a threat to the motoring public. As their owners will tell you, imported cars provide for a need in the marketplace that currently does not exist. Imported vehicles are safe and on average, more environmentally friendly and cost effective than domestic vehicles. Changing the 15 year import law now would be a big mistake and send the wrong message on the environment and free trade. Not only would it negatively impact choice for the car collector, many small businesses across Canada would be destroyed. Keeping the current law is in the best interest of all Canadians. Please Stop the 25 year import law change. Add me to the list of people who are publically opposing the change to 25 years. Disclaimer: we will never share, publish or make public your email address. Stop the 25 year rule! Transport Canada is thinking about changing the vehicle import law from 15 years to 25 years old, help us send them a message; THIS IS A BAD IDEA. According to current law, Canadian citizens can import any vehicle outside North America that was manufactured 15 years ago or older. American citizens can also import vehicles to the US, but they have to be 25 years or older. Pressure is building for Canada to change our law to match the United States, 25 years. This change in law would unfairly limit Canadian consumers and destroy many small businesses. Imported vehicles are safe, environmentally friendly, cost effective, and in such low numbers they pose no threat to the Canadian public. The Mitsubishi Delica is a seven passenger 4-cylinder Diesel 4WD Van. It is popular in Canada because there isn't anything like it in the Canadian marketplace. Printer friendly version of this page.